We accommodate your international and local moving needs all year round, utilising the most current equipment, tested methodology, and sophisticated crew in the industry with ENTHUSIASM, DILIGENCE, PASSION. Be it commercial or residential relocation, Zealous Mover can make relocation a breeze for our clients. We understand the unique demands of the myriad types of relocation, and at the same time appreciate that what remains unchanged is the need to give our clients peace of mind. Zealous Mover has core competency in moving and packing, having streamlined and enhanced its moving and packing process over its years in business. Wrapping material is an essential element in preserving the integrity of your chattels. Zealous Mover is meticulous in the selection of the most suitable material for your chattels. Zealous Mover provides both short term and long term storage solutions to meet your interim moving needs. Your furnishings and personal items will be wrapped, bubble-packed and protected in our storage facility. 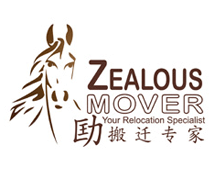 Should our clients need to dispose unwanted furniture or equipment, Zealous Mover stands ready to provide that service. Zealous Mover is mindful that time is of the essence in commercial dealings. Our delivery service has constantly gone beyond our clients' expectations in providing timely and reliable delivery service. Let Zealous Mover's team of experienced personnel assess your moving needs and provide a cost-effective solution tailored to your unique set of needs.